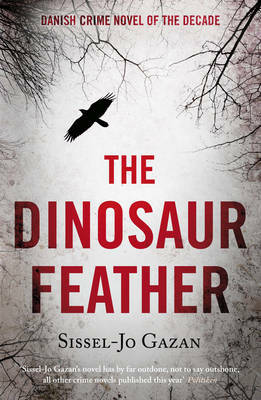 First published in 2008, THE DINOSAUR FEATHER reaches an English-language readership garnered with ecstatic praise, including the accolade of "Danish crime novel of the decade". There are three main characters: Anna Bella Nor, a PhD student; Soren Marhauge, a police detective; and, in Canada, Clive Freeman, a respected but marginalised evolutionary biologist. It is not until page 300 that the pace picks up and the crime plot really gets going (although there are a couple of imaginative murders on page 150 and page 250, they remain an enigma for quite a while). Most of the book, therefore, is about the lives of Anna Bella, Soren and Clive, rather than being a "typical" crime novel. Anna Bella is a student at Copenhagen University whose thesis project is to dissect two competing theories about the evolution of birds - are they flying dinosaurs or did they evolve independently? She works in a fusty department, virtually ignored by her grumpy supervisor Lars Helland and not receiving much support from her friend Johannes, another graduate student. Anna Bella has a three-year-old daughter; she struggles to look after the little girl while undertaking her studies, and feels resentful at her mother for taking over rather than just helping with the childcare. Anna Bella is always angry, losing her temper with everyone at the drop of a hat, so is fairly hard to sympathise with, however challenging her circumstances. The other two protagonists also have complicated personal life-stories. Soren's parents died in a car crash when he was young so he was bought up by his grandparents, both now dead. His marriage broke up, he experienced a tragedy that he has not recovered from, and he's alienated from his police colleagues. Clive is presented in an unsympathetic light as an obsessive biologist with a horrible father who has made his career out of insisting that birds evolved independently of dinosaurs. As a young man he took his neighbour's son Jack under his "wing" (so to speak!) and taught him about biology, but the relationship had dark undercurrents. When Jack grew up he became the editor of a scientific journal so the two men occasionally meet when Clive wants to publish his research. Many details of the preceding events are provided over two-thirds of the book: Soren's grandparents' deaths; Clive's nasty behaviour to his wife and sons; the rivalry between the Canadian and Danish labs, etc. Some of these are interesting in themselves, others less so. After all this "back story", things pick up once Anna Bella and Soren, who have met as a result of the two deaths, independently begin to work on some tangible clues for the crimes. In parallel with their investigations, both of them uncover stories about their own pasts, filling in some of the earlier gaps though not necessarily in a way relevant to the crime plot. I find this a hard book to sum up. I enjoyed the final 200 pages and think I would have liked the whole novel more had the first part been much shorter, without all the (to me) irrelevant details about characters' past lives, particularly concerning minor figures who are not important for the main plot. For such a long story, I was slightly irritated by the highly relevant elements that were simply omitted from descriptions or later turned out to be lies; the several pertinent new characters who suddenly appeared in the final part; and some of Anna Bella's actions (eg not telling the police where a key suspect is hiding out which seems to be more about spinning out the plot than anything else). But it is always nice to read a book with a capable, independent female lead and one in which scientific research is central, even though some aspects did not seem very realistic (such as Clive waiting for print editions of journals to find out about the latest research in his field, which people last did about 20 years ago). I did enjoy this book, but it is far too long and discursive; a firmer edit (for length and style) would have made it a much better focused, smoother read, and allowed it to fulfil its potential.